Tulin, F. (2019). Mating and Tetrad Dissection in Chlamydomonas. Bio-protocol Bio101: e3207. DOI: 10.21769/BioProtoc.3207. The ability to carry out controlled genetic crosses has contributed to making the unicellular green alga Chlamydomonas reinhardtii an important model organism for the green plant kingdom (Merchant et al., 2007). This protocol describes a simple and reliable method for crossing Chlamydomonas strains of opposite mating types and dissecting out the meiotic progeny for genetic analyses. The protocol should apply in general to motile strains with functional flagella but has only been routinely used with strains in the CC-124/125 background. A key aspect is access to a microscope equipped with a microdissection needle for manipulation of individual cells with high accuracy. For an extended description of the mating process, the reader is referred to the excellent article by Dutcher (1995). For variations on this procedure, see Note 1. Chlamydomonas has two mating types, designated mt+ and mt- (Dutcher, 1995). Mating is only possible between strains of opposite mating type. If the mating type is unknown, a test cross to a strain with a known mating type can be performed; if the strain with unknown mating type successfully mates with an mt+ strain, it is mt-, and vice versa. Alternatively, a polymerase chain reaction (PCR) assay can be performed to determine the mating type (Zamora et al., 2004). The following protocol assumes that the mating types of the strains are known. In general, handling of strains may be done in a sterile hood to minimize the risk of airborne contamination. Streak the mt- and mt+ strains to be mated in patches (~1 x 2 cm) on TAP agar plates and place in an incubator at 21-25 °C under ~50 μmol m-2 s-1 white light, for five days. Streak only a thin layer of cells. The cells will grow into a dark green patch during incubation (Figure 1). Figure 1. Streaking strains to be mated. Six strains streaked on a TAP agar plate and incubated for 5 days in preparation for mating (Step A1). After five days, scoop up cells from the agar plate with a sterile inoculating loop. Resuspend mt- and mt+ cells separately in 200-500 μl mating medium in optically transparent culture tubes (preferably glass) by gently rubbing the cells against the wall of the tube, just at the liquid surface. Do not vortex. The result should be an evenly green suspension (Figure 2) at approximately 1 x 107 cells per ml with roughly similar cell densities for both mating types. Figure 2. Cells to be mated. 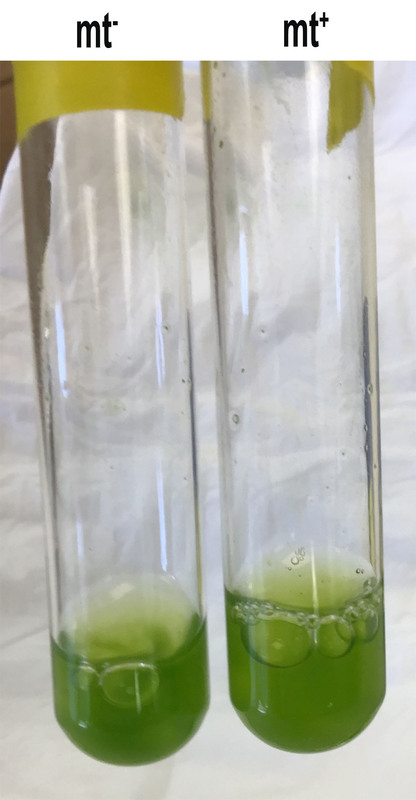 The cells were resuspended in 1 ml mating medium in glass culture tubes (Step A2). Place the tubes at a near-horizontal position (to maximize light exposure; Huang and Beck, 2003) under ~50 μmol m-2 s-1 white light for 5-7 h to let the cells complete gametogenesis. If you are working with a strain with negative phototaxis (common in the CC-124 genetic background) (Ide et al., 2016), it is necessary to shake the tubes gently at ~100 rpm to keep the cells suspended. Optional: After 5-7 h, assess mating potential under the microscope. First, pipette 20 μl of each gamete suspension separately onto a microscope slide, cover with a cover slip and observe using a 40x phase objective. If gametogenesis was successful, you should see the gametes swim around vigorously. Note the presence and appearance of any cell clumps. Then, mix 10 μl of each strain (mt- and mt+) together onto a glass slide, wait 10 s, cover with a cover slip and observe in the microscope. In addition to fast-swimming gametes, you should see mating ‘clusters’ of two or more cells with their cilia entangled. These mating clusters display a jiggling or shaking motion (Videos 1 and 2), which distinguishes them from cells that are merely clumping together. Observation of mating clusters at this point is a reliable sign that the mating will succeed. After 5-7 h under the light, or as soon as mating clusters have been confirmed visually, make a ‘mating suspension’ by mixing 150 μl of mt- and mt+ gametes in a new glass or Eppendorf tube. Incubate without shaking for 1-2 h under ~50 μmol m-2 s-1 white light. Do not incubate more than 2 h.
Optional: After 1 h, assess formation of dikaryons resulting from the fusion of two gametes. 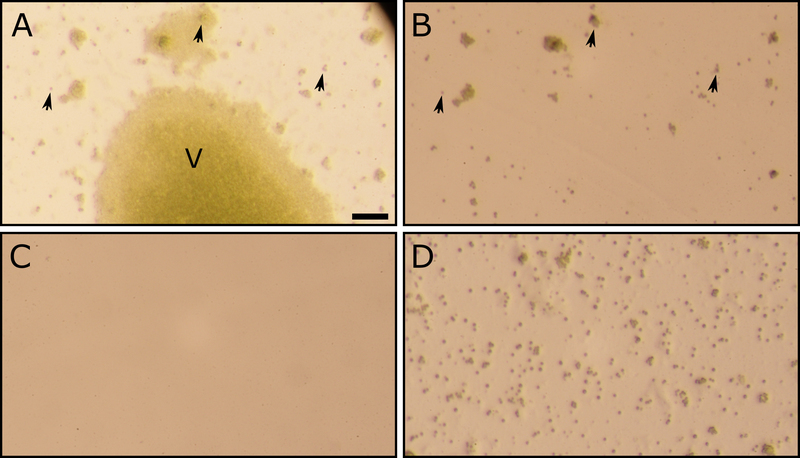 In iodine-immobilized samples, dikaryons can be distinguished from unmated cells based on the presence of four cilia (compared to two in the gametes). To look for dikaryons, pipette 3 μl iodine solution onto a slide, then pipette 17 μl from the mating suspension. Cover with a cover slip and observe with phase contrast optics using the 40x objective. You should observe unmated cells (gametes) with two cilia (Figure 3A), and dikaryons with four cilia (Figure 3B). The dikaryons are generally in the minority (< 10%). Positive identification of dikaryons at this point is a reliable indication that the mating will succeed. Pipette 200 μl of mating suspension onto a TAP plate and spread the liquid around gently using a bacterial spreader. Seal the plate with micropore tape. Wrap in tin foil and put away in a dark place at room temperature for 5 days. Figure 3. Observation of cilia after immobilizing cells with iodine solution (Step A6). A. Unmated gametes. Each cell has two cilia (arrows). B. Mating suspension containing mixture of unmated gametes and dikaryons (asterisks) with four cilia. Scale bar = 20 μm. During the five-day dark incubation, dikaryons will mature into thick-walled zygospores. 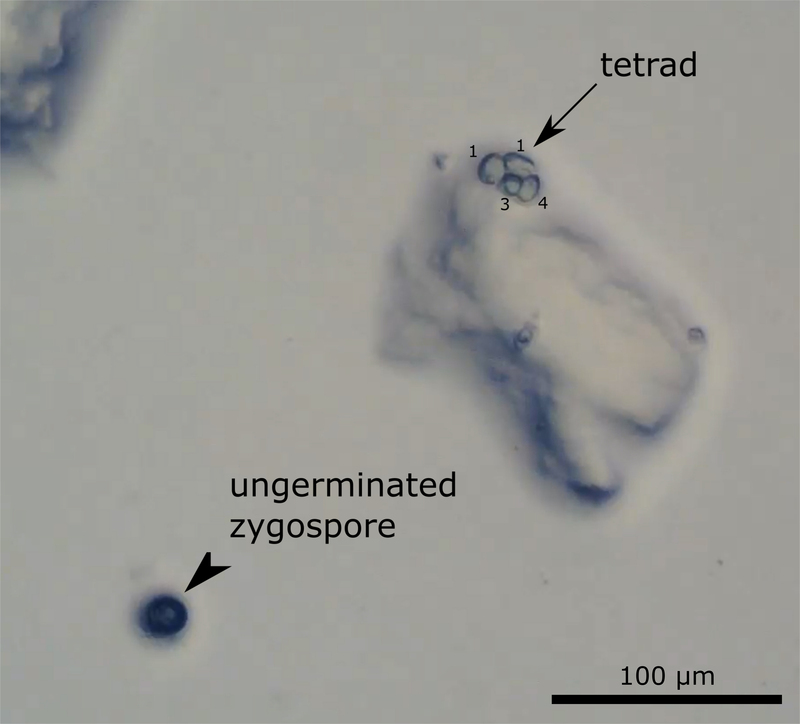 After 5 days, the zygospores are distinguishable from unmated vegetative cells (usually present in large excess on the plate) in the stereomicroscope by their larger size and darker appearance (Figure 4A). The following steps describe how to separate the zygospores from the unmated cells and carry out tetrad dissection. The combined effects of the physical separation of unmated cells from the zygospores by scraping (Step B1), isolation of zygospores based on microscopic morphology (Step B4), and positive identification of a meiotic “tetrad” by presence of the shed zygospore wall (Step B6), make this procedure an efficient and reliable way to perform genetic analysis in Chlamydomonas. With a sharp sterile razor blade slightly inclined relative to the agar surface, gently scrape away unmated cells towards the edges of the plate. The result can be inspected under the stereo microscope to verify removal of most unmated cells (Figure 4B). Figure 4. Unmated vegetative cells are removed by scraping with a razor blade. A. TAP agar plate incubated for 5 days in the dark after spreading the mating mixture (Step A7). The plate contains mature zygospores (arrows) as well as a large number of unmated vegetative cells (V). B. 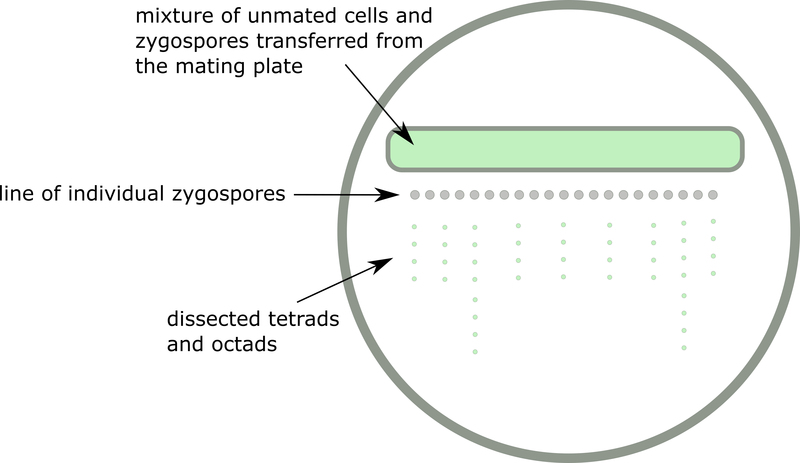 After scraping the agar surface gently with a sharp razor blade (Step B1), most unmated cells are removed, but the zygospores remain adhered to the agar (arrows). C. After scraping the surface a second time (Step B2), the zygospores have detached from the agar. D. Zygospores transferred to a new agar plate for tetrad dissection (Step B3) Scale bar = 125 μm. Pipette 200 μl mating medium (TP-N) in the middle of the plate (where unmated cells have been removed) and scrape the plate again with a razor blade. This time, hold the razor almost perpendicular to the agar surface and apply enough pressure that you see small ridges appear on the surface of the plate. This will detach the zygospores from the surface and they will collect in the liquid. Transfer and distribute 100 μl of the liquid containing detached zygospores along a line (~½ cm wide) across the top ¼ of a fresh TAP plate (Note 3, Figure 5). Let the liquid soak into the plate. 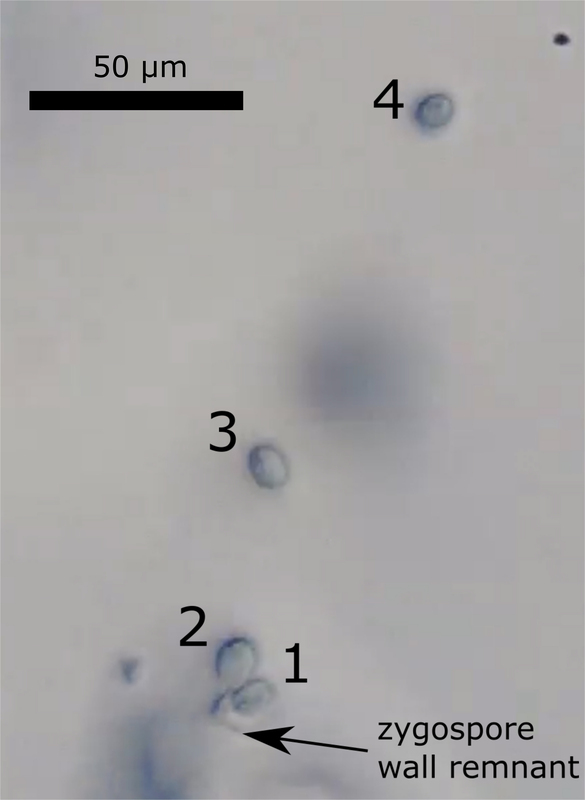 Once the liquid has soaked in, the thick-walled zygospores are readily distinguished from unmated cells when observed through a 5x objective (Figure 6). Figure 5. Schematic representation of a typical dissection plate. Note that not all zygospores germinated successfully to yield a tetrad or octad. Figure 6. Distinguishing zygospores and vegetative cells in the microscope. When the liquid has soaked into the agar, zygospores (larger, with a darker contour) can be distinguished from vegetative cells (smaller, lighter appearance) (Step B3). The microdissection needle is shown touching the agar surface. The cells were observed with a 5x objective. Scale bar = 50 μm. Figure 7. Distinguishing ungerminated zygospores and tetrads in the microscope. Scale bar = 100 μm. Looking through the 5x objective, use the microdissection needle to pick up at least 20 individual zygospores and line them up below the area transferred in Step B3, approximately 1-2 mm apart (Figure 5; line of individual zygospores). Return the plate to the incubator (~50 μmol m-2 s-1 continuous white light, 21-25 °C) for 16 h. During this time the spores will begin to undergo meiosis and produce tetrads of four meiotic progeny. Tetrads are clearly distinct from an ungerminated zygospore (Figure 7). Note that the timing of meiosis may depend on light quality/intensity and temperature. After 16 h in the light, start monitoring the line of zygospores prepared in Step B4 for release of meiotic tetrads. For each zygospore that has undergone meiosis, proceed to Step B6. Then return the plate to the light and check again after 1-2 h. Most, but usually not all, zygospores complete meiosis within 30 h. Sometimes the result will be eight cells (an ‘octad’ instead of a tetrad) if the meiotic progeny go through one extra mitotic division before the zygospore wall breaks down. This step requires practice and some patience for the inexperienced user. Gently poke the tetrad/octad with the microdissection needle to separate the cells (Video 3). Try to identify the zygospore wall. Important: The remnant of the zygospore wall should be visible in the microscope looking through the 5x objective as a translucent crescent (Figure 8, Video 3). Observing the wall remnant indicates that the group of four (or eight) cells is indeed a tetrad (or octad). To pick up cells, place the dissection needle immediately under a cell or group of cells. Focusing on the cells, move the needle up to where it just touches the agar surface, then move it down again. If any cell(s) were picked up, move the needle to a new area on the plate and reverse the procedure to deposit the cell(s) on the agar. Repeat until all four cells from the tetrad have been deposited in a straight line ~1-2 mm apart (Figure 5). Pierce the agar several times at the top of the line. This helps mark the dissected tetrad and cleans the needle before starting on the next one. Note: Try to minimize the cell’s “air-time” on the microdissection needle to prevent loss of viability due to desiccation. It should not be necessary to keep any individual cell(s) on the needle for more than 5 seconds at a time. Variation 1: Deposit the cells in a small square pattern (Video 3). After a few days, each cell will have grown into a microcolony. At this point, deposit cells from each microcolony in a straight line ~2 mm apart (as above) and let macroscopic colonies form. Monitor the microcolonies daily to make sure they do not grow into each other, which would lead to mixing of different meiotic clones. This approach is less sensitive to death of individual cells and may therefore increase the number of complete tetrads obtained, especially for inexperienced users. Make sure to clean the dissection needle by piercing the agar several times, to prevent mixing of different meiotic clones. Figure 8. Four meiotic products (one tetrad) pulled apart. The tetrad has been pulled apart and the remnant of the zygospore wall can be seen. The presence of the zygospore wall is a reliable sign that the group of four cells is a tetrad, rather than four vegetative cells grouped together. Scale bar = 50 μm. When dissection if complete, return the plate to the incubator (~50 μmol m-2 s-1 white light, 21-25 °C) for 5-7 days or until small macroscopic spores can be seen with the naked eye (Figure 9). With a sterile toothpick, pick and restreak the colonies from each tetrad on a fresh TAP plate. Each column should be an individual tetrad. Since the colonies may be small and close together, it helps to perform this step under a stereo dissecting microscope. 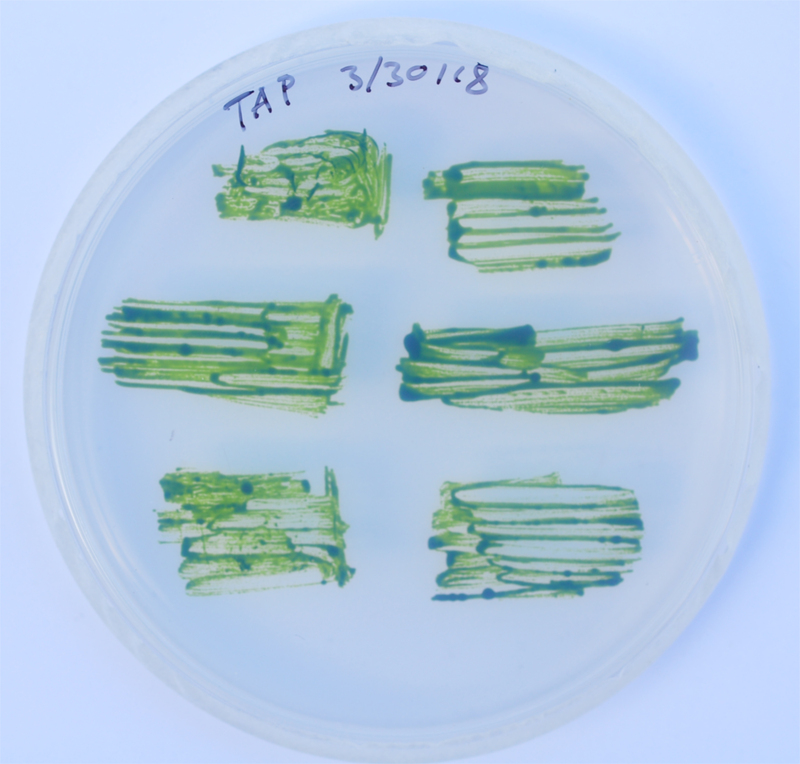 Return the plate with the restreaked tetrads to the incubator for 3-4 days or until a small green patch of cells has formed. From this plate, test for segregation of genetic markers and traits of interest (Figure 9; Table 1). Typical result and data analysis: The four haploid cells in the tetrad result from meiosis in the zygospore and the segregation of unlinked genes follows the standard Mendelian rules for inheritance. A typical result for a cross with two independently segregating traits (temperature sensitivity above 28 °C, and paromomycin resistance) is shown in Figure 9 and Table 1. The reader is referred to texts on tetrad analysis and meiotic segregation for further details, for example Hawley and Walker (2003). Figure 9. Result of tetrad dissection. (Top) Dissection plate after incubation for one week at 21 °C. Tetrads (red asterisks) and octads have grown up to macroscopic colonies that can be picked under the dissecting microscope using a toothpick. 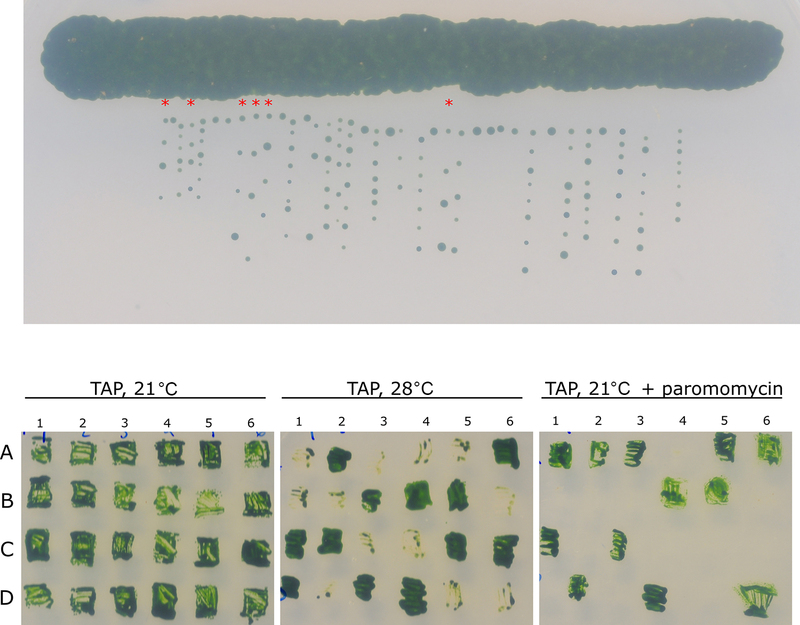 (Bottom) Six tetrads transferred from the dissection plate to a fresh TAP plate and assayed for growth at 28 °C and on TAP plates supplemented with 5 μg/ml paromomycin. Temperature-sensitivity (dead at 28 °C) and paromomycin resistance (viable on 5 μg/ml paromomycin) segregate as single-gene traits. Table 1. Scorecard for the tetrad analysis in Figure 7. This cross was performed with an mt- strain that is resistant to 5 μl/ml paromomycin and an mt+ strain that is inviable at 28 °C. Viability at 28 °C and growth on TAP medium supplemented with 5 μg/ml paromomycin were scored. Three different types of tetrads are represented, T: tetratype, PD: parental ditype, NPD: non-parental ditype. A-D refers to the four individual segregants in each of the six tetrads scored. Variations on the protocol. The protocol presented here works well in the author’s hands, but several variations on the basic procedure are also available. See for example http://www.chem.ucla.edu/dept/Faculty/merchant/pdf/embo_protoc_2006.pdf, which differs slightly from the current protocol on several points. Microscopes equipped with a microdissection needle (Sherman, 1973) are found in most yeast biology laboratories, but are not yet wide-spread in the Chlamydomonas field. It is the author’s experience that the speed and accuracy of Chlamydomonas tetrad analysis is greatly improved by using this type of microscope. One commercially available model is the Axio Scope.A1 from Zeiss, equipped with a microdissection needle, which the author has used extensively with good result. Another option may be the MSM400 dissection microscope from Singer Instruments. It is important that the plates used for dissection are not too dry since picking up and depositing zygospores and meiotic progeny with the microdissection needle depends on the presence of a thin sheet of water. This water also prevents the cells from drying while traveling on the needle. Too much water could also impair dissection by causing the cells to slide off the needle. To prepare adequately moist TAP plates for dissection, let the plates dry for 2 days at room temperature after pouring with the lids on, then store them sealed in a plastic envelope at 4 °C. It is very helpful to pour plates to be used for tetrad dissection on a level surface, to keep the surface of the agar in focus during dissection. Hutner’s trace elements solution can be prepared as described at https://www.chlamycollection.org/methods/media-recipes/, or purchased through the Chlamydomonas resource center: https://www.chlamycollection.org/product/hutners-trace-elements/. An alternative formulation of trace minerals, with the advantage of easier preparation, has been described (Kropat et al., 2011), but not tested by the author. I thank Masa Onishi and Dr. John Pringle for generously letting me use their microdissection microscope and camera, and Masa Onishi for providing the tetrad dissection video. I also thank the European Union’s Horizon 2020 research and innovation programme for support from a Marie Sklodowska-Curie grant (agreement No 798198). This protocol is adapted from Dutcher (1995). Competing interests: I declare no conflicts of interest or competing interests. Dutcher, S. K. (1995). Mating and tetrad analysis in Chlamydomonas reinhardtii. Methods Cell Biol 47: 531-540. Hawley, R. S. and Walker, M. Y. (2003). Advanced genetic analysis: finding meaning in a genome (Blackwell Pub). Huang, K. and Beck, C. F. (2003). Phototropin is the blue-light receptor that controls multiple steps in the sexual life cycle of the green alga Chlamydomonas reinhardtii. Proc Natl Acad Sci U S A 100: 6269-6274. Ide, T., Mochiji, S., Ueki, N., Yamaguchi, K., Shigenobu, S., Hirono, M. and Wakabayashi, K. I. (2016). Identification of the agg1 mutation responsible for negative phototaxis in a "wild-type" strain of Chlamydomonas reinhardtii. Biochem Biophys Rep 7: 379-385. Kropat, J., Hong-Hermesdorf, A., Casero, D., Ent, P., Castruita, M., Pellegrini, M., Merchant, S. S. and Malasarn, D. (2011). A revised mineral nutrient supplement increases biomass and growth rate in Chlamydomonas reinhardtii. Plant J 66(5): 770-780. Merchant, S. S., Prochnik, S. E., Vallon, O., Harris, E. H., Karpowicz, S. J., Witman, G. B., Terry, A., Salamov, A., Fritz-Laylin, L. K., Marechal-Drouard, L., Marshall, W. F., Qu, L. H., Nelson, D. R., Sanderfoot, A. A., Spalding, M. H., Kapitonov, V. V., Ren, Q., Ferris, P., Lindquist, E., Shapiro, H., et al. (2007). The Chlamydomonas genome reveals the evolution of key animal and plant functions. Science 318(5848): 245-250. Sherman, F. (1973). Micromanipulator for yeast genetic studies. Appl Microbiol 26(5): 829. Zamora, I., Feldman, J. L. and Marshall, W. F. (2004). PCR-based assay for mating type and diploidy in Chlamydomonas. Biotechniques 37(4): 534-536. How to cite: Tulin, F. (2019). Mating and Tetrad Dissection in Chlamydomonas. Bio-protocol Bio101: e3207. DOI: 10.21769/BioProtoc.3207.